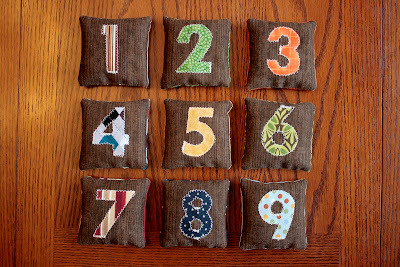 Below you'll find my tutorial for a set of numbered bean bags. It's a great gift idea for kids. 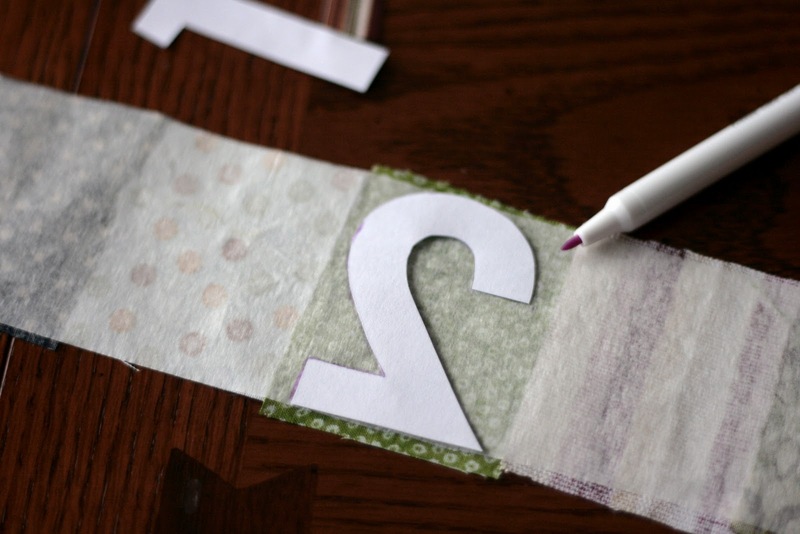 You can further personalize it with different colors and putting the letters of the child's name on the backs. To make these, you'll want to download my pattern (free!) 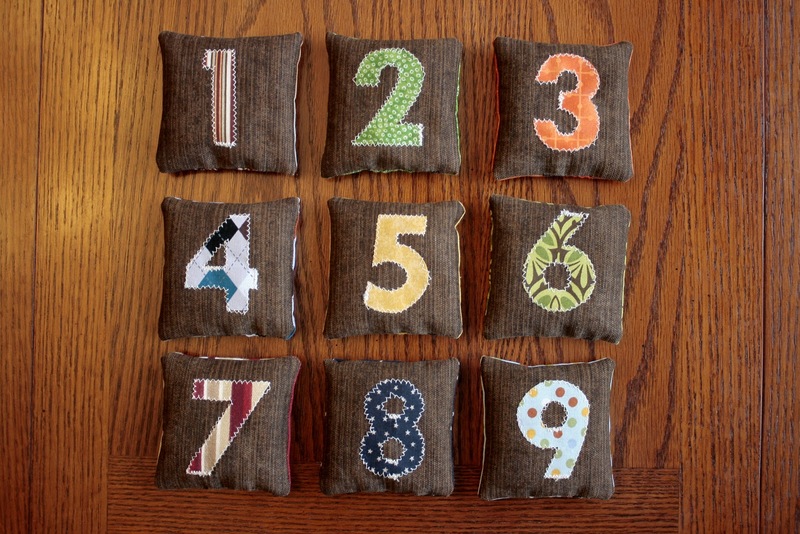 that includes the numbers and square for the beanbags. I didn't use a number zero but my husband was concerned that someone might want it, so it's included in the pattern. First, print out the pattern and cut out all the paper numbers and 9 fabric squares for the beanbag fronts and 9 fabric squares for the backs. I did brown for the front and different colors and patterns for the numbers and backs. 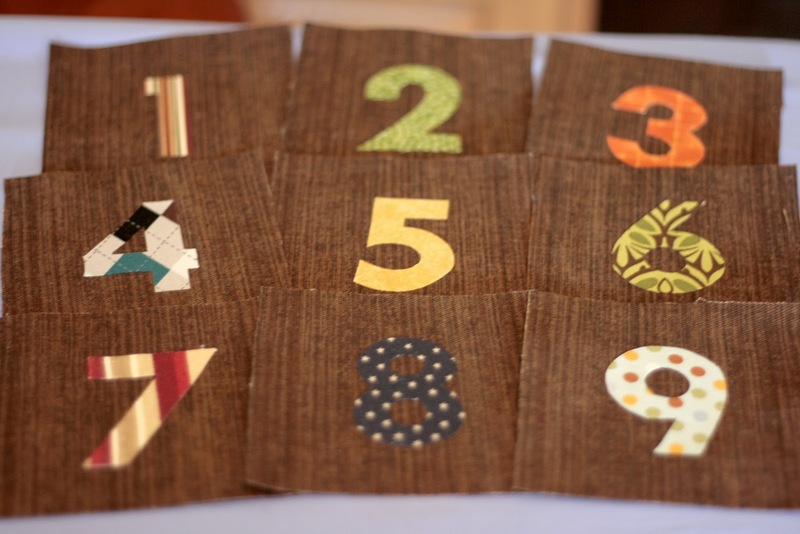 Next, cut out nine fabric rectangles a little larger than your numbers. 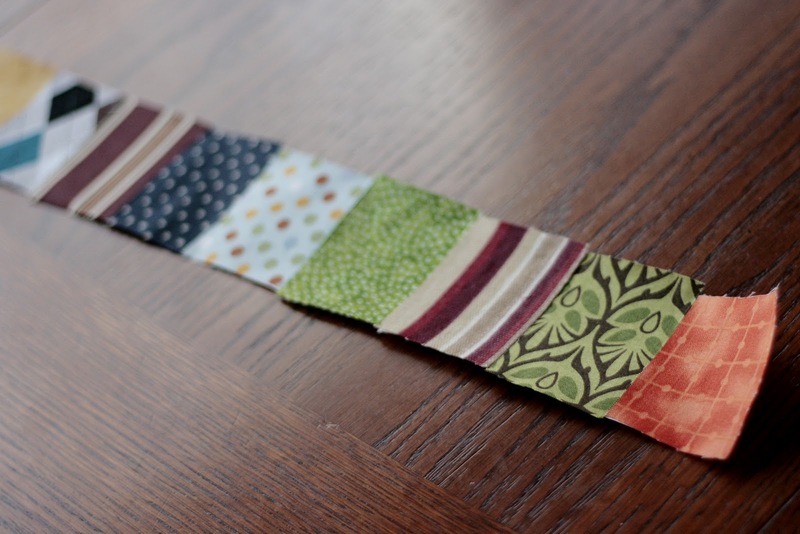 Iron those to a strip of fusible web. On the back, trace each number backwards, then cut out each number. Peel the backing off the fusible web and iron the numbers to the centers of your beanbag fronts. 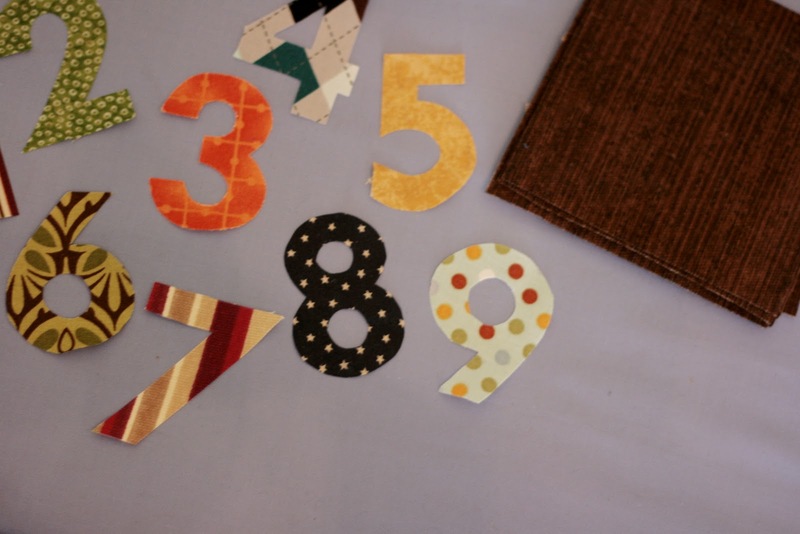 If you want more details on making the number appliques you can see my post on appliques here. 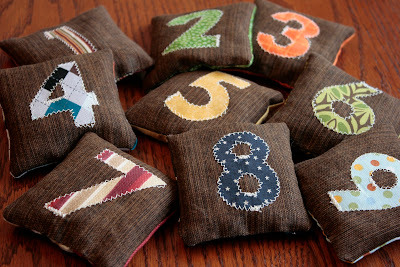 Next I did a loose zig zag stitch with my sewing machine around each number. The curves got tricky so I had to turn the hand wheel for some parts and stitch very slowly. Then put right sides together of your beanbag fronts and backs and stitch them up leaving a 2" opening at the bottom. 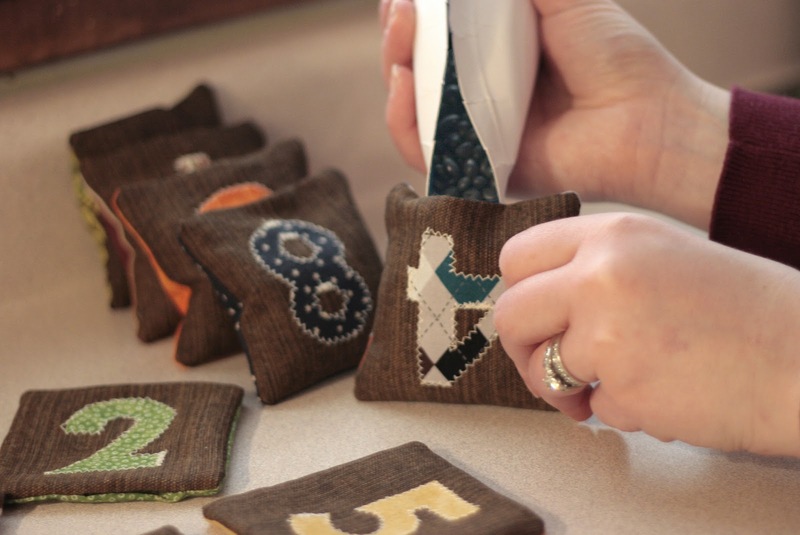 When you are done stitching, turn them right side out. I tried to fill these with a funnel but my funnel opening was too small so I used a rolled up paper plate to fill each bag with dried black beans. I filled each bag until it was 3/4 full and used a pound and a half total for all nine bags. Next I sewed the openings up using a slipstitch. A slipstitch is a (mostly) hidden seam. 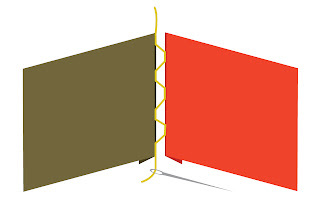 To do this you'll first fold the raw edges inside. Then knot your thread and starting at one end of the opening, you'll alternate between the inside folds of the fabric stitching about 1/16" inch of fabric on each side and then pull tightly. Beanbags are now finished and ready to be played with! And if you need a place to store these, you can find a tutorial on Craft Buds for a matching drawstring tote! Hope you enjoyed the tutorial and make sure to visit us! Want to win a set of these bean bags? Head to our weekly giveaways roundup! Thanks Craft Buds...now go say hi! and be sure to visit all the other parties too! I love the colors, fabrics and style of those beanbags. Definitely headin' over to Craft Buds to check out more of their projects. Thanks Holly! Oooh I'm glad you featured them! I'm heading over there to check them out! Good tutorial Great bags! I'm visiting from Craft Buds. Great blog! These look great! Thanks for the tutorial! Thanks for the cute tutorial! my nephew would love this! Love the bean bags, great learning tool for kids. Oh my goodness is this cute!!! These are so great! My kids would love these! I love these bean bags....I've actually started to make some myself! I would love to win these! What a great way to learn for kids! My daughter would love this. She has had such a hard time with recognizing numbers. What a fantastic idea. 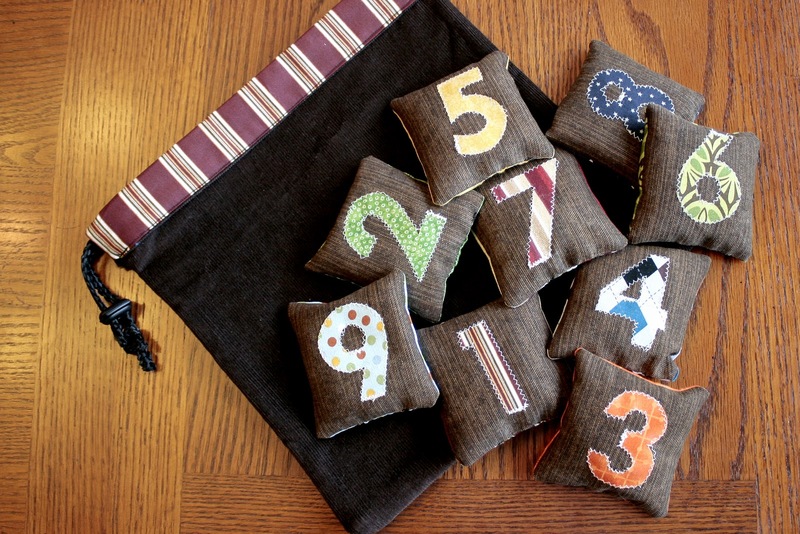 Fabulous idea--great for when the grandchildren visit and I like the drawstring bag. I love these! New to your blog! Thanks for shairng this tutroial with us! Come by cookieandclaire.blogspot.com when you have time! I think we need them! so cute...but let me ask this...would it be rude to sew things like answer the phone, shut the cabinet door, pick up your socks on them, and then gently and lovingly toss them at hubster when he offends? :) this is what people without kids do to cute activity crafts. fun! my kids would love these! I love these great bean bags. Great way to play with little ones. Thanks for sharing. I love this tutorial. Thanks for sharing! I am a new follower! I love these beanbags. So cute. Love this tutorial! Thank you for sharing! Great Tutorial! This is exactly the kind of toys I like for my daughter to have. Will definitely enter the give a way, but won't mind making these if I don't win. lovin the bean bags. Thanks for sharing. Love these! 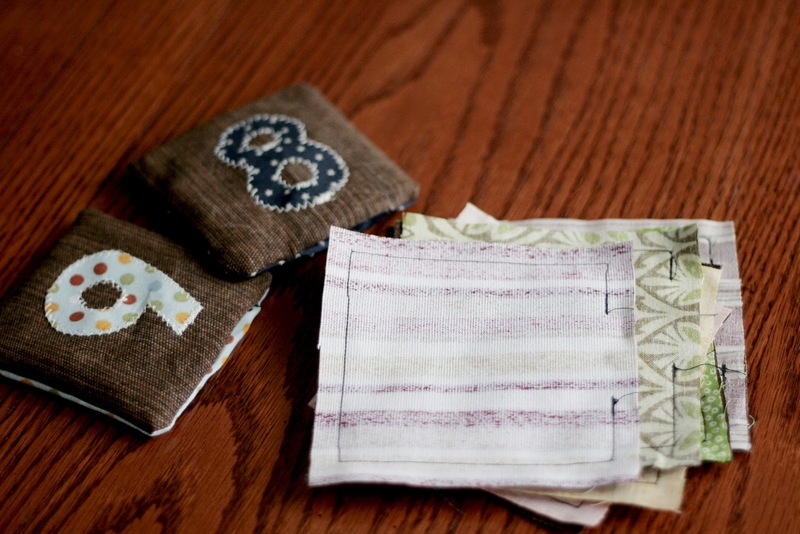 Thanks for linking to Quiltstory!